The list of problems around the Rio Olympics have included health and safety risks for fans, and now you can add cybersecurity risks to that list, according to Proofpoint. According to cyber-security solution provider, thousands of potential risks in Olympics-related social media accounts and mobile apps are associated with the 2016 Olympics. “While physical safety concerns are important for athletes and fans attending the games in person, digital concerns can affect not only those present in Brazil, but also fans watching online at home,” explained Devin Redmond, vice president & general manager of digital security & compliance at Proofpoint in an email. Proofpoint analyzed more than 1,300 Olympics-related social media accounts and thousands of mobile apps across Facebook, Twitter, Instagram, Google+ and YouTube. It concluded that 15 per cent of the analyzed pages were fraudulent, featuring illegal live streaming, phishing, illegal ticket sales, and more. Proofpoint says that bad content incidents increased 60 per cent leading up to the games, while overall Olympics social content had risen by 200 per cent. While it’s easy for critics to blame every Olympic mishap on Brazil’s economic downfall, these cyber-security threats can’t be completely attributed to that. Proofpoint’s technology collects data using a social discovery tool, and then assesses it with a risk classification tool. According to Redmond, the discovery tool universally searches social networks to find accounts that are using the name or other brand elements of the Olympics or sponsor brands. Redmond also said that he sees consistent trends for other major sporting and world events. Since these events attract large audiences searching for coverage on social media, malicious hackers are aware of this, and create infrastructure designed to phish, scam, and spread malware to the highest percentage of viewers. 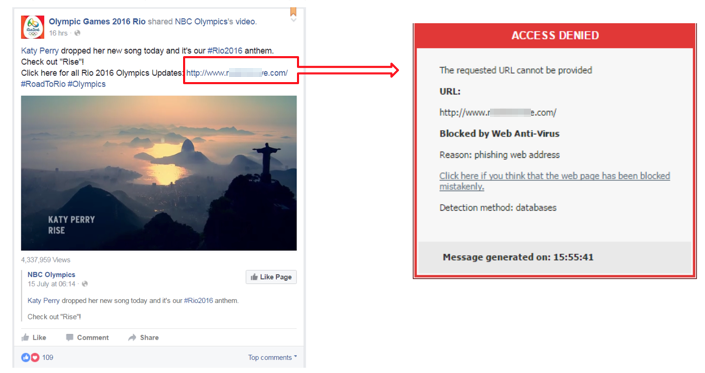 In a company blog post, Proofpoint advises Olympic fans to be cautious when seeking out Rio-related online content. It recommends that individuals only engage with verified social media pages, use official mobile apps linked from a brand’s official website, purchase event tickets from the official Olympics site, and avoid “too good to be true” streaming offers. It also advises Olympic-related brands to automate comment moderation to deal with the increase in content volume and potentially offensive or malicious posts. Additionally, Proofpoint advised that brands should consider adding tools to mitigate account hacks and limit the number of connected apps that can publish content on company pages.